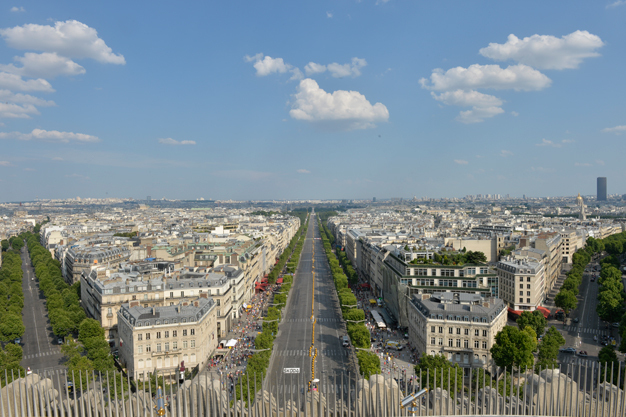 Make a donation to offer everyone access to a magnificent view of all of Paris. An image symbolic of Paris, the Arc de Triomphe attracts each year more than 1.7 million French and foreign visitors who, after having climbed 284 steps, enjoy, from the terrace, day and night, a unique panorama of the Champs-Elysées and views from the perspective of the Place de l'Étoile. Today, people with reduced mobility can take a lift located in the southwest pillar to access the Attic on the first floor and discover the museum and store. But often, they cannot take the 40 remaining steps to reach the terrace. So that everyone, including people with reduced mobility, may benefit from this exceptional view, the Center for National Monuments (CMN) is launching major renovations. An elevator will be installed in the Attic for access to the terrace. And the terrace itself will be equipped with ramps making it possible to do the complete tour by wheel chair. Bring your support to French heritage. Make a donation to offer everyone access to a magnificent view of all of Paris. However much you donate, if you wish you can have your name (or the name of a person of your choice) listed on the donors page of the website. > For all donations above €300, you will be invited, with the person of your choice, to the inauguration of the elevator bringing access to the Arc de triomphe’s terrace. > For all donations above €1,000, you will be invited, with the person of your choice, to a private guided visit with the director of the Arc ; you will become a member of the Centre des Monuments Nationaux sponsors club and will be invited for one year, with the person of your choice, to our unique events all over France (Invitations to Monuments en mouvement, Monument en musique, exhibition previews, etc. ).